Public Services – Recruitments – Filling of Fifteen Thousand Five Hundred and Twenty Two (15,522) vacant posts through Direct Recruitment – Permission to the Recruiting Agencies – Orders –Issued. The Secretary, Telangana State Public Service Commission and other recruiting agencies shall take appropriate steps for filling the above vacancies through direct recruitment by obtaining the details, such as local cadres of the vacancies as per the Presidential Order(zone/ district etc.,), roster points, qualifications, etc., from the concerned authorities. 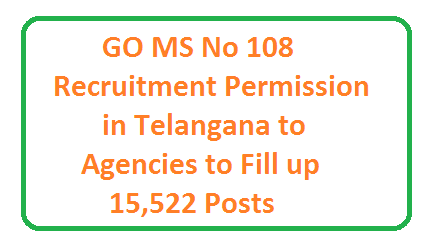 The Telangana State Public Service Commission and other recruiting agencies shall issue schedule for recruitment expeditiously and issue notification accordingly. All administrative departments and the Heads of Departments, Managing Directors concerned shall furnish details of all vacant posts authorized in this order, including the local cadre wise vacancy position, roster points and qualifications, etc., to the recruiting agencies immediately under intimation to Finance Department. For the posts authorized to be filled by the Departmental Selection Committees, and the corporations, the administrative departments of secretariat and the heads of departments concerned and the corporations as the case may be, shall take necessary action for filling the respective posts duly following the Rule of Reservation, the provisions of the Presidential Order and the provisions of the Service Rules applicable to the relevant posts. They shall adopt a transparent selection procedure based on written test for the purpose. The departments shall obtain specific orders on the composition of the selection committee, selection process and other issues related to the recruitment process duly following the rules of business.